I don't know what everyone's all excited about. This is why the Eagles schedule five preseason games in the first place. Michael Vick didn't have his greatest game. In fact, he was downright bad, with four interceptions and a few more close calls. But, as Andy Reid said after the game, Vick was just "rusty." After he injured himself the last two times he took the field, it was good to see Vick back out there today, and his ability to "just keep shooting" will help him once the real games start. What's that? Yes, you're right. Vick was supposed to show improvement this year, considering he had his "first real offseason as a starter" with quarterback gurus Reid and Marty Mornhinweg. But I'm sure that "new Vick" is coming soon. The fact that he looked worse than ever, making poor decisions and forgetting that linebackers existed in coverage, is a small thing. 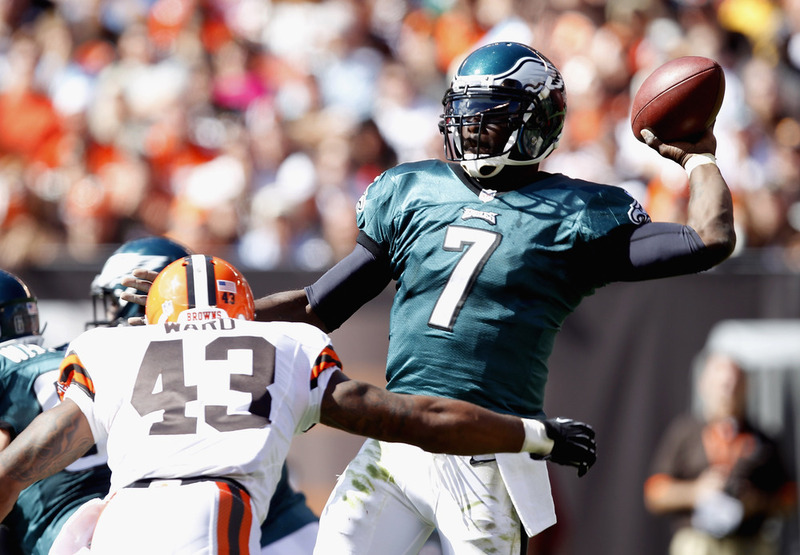 Vick needed to get out some of the bugs, and what else is a dress rehearsal for? That must have been the reason Reid and Mornhinweg didn't use LeSean McCoy. Vick had 65 pass drop backs in the game, while the Eagles All-Pro running back—who the Browns demonstrated an inability to stop—was a sideshow for most of the afternoon. Better to keep McCoy fresh for the games that count, I suppose, and let Vick get more practice throwing interceptions. That goes double for Jeremy Maclin, who racked up yardage and a touchdown, but wisely avoided blocking down the field and dropped a few balls just for practice. We wouldn't want the biggest of the Eagles' healthy wide receivers to actually demonstrate toughness yet. We can probably also discount the inebriated performance of the offensive line. Howard Mudd was just using this game to test the replacement referees' definition of holding and roughing the passer. When Danny Watkins let his man stream by him off the snap, I'm sure it was in service of one of those goals. Same with the time that McCoy tried to run behind his left tackle, and the King in the North just stood there, idly watching. Besides, the defense looked great, didn't it? Let's not discount their improvement. Yes, it was against on offense that probably had trouble tying its shoes in the morning, but that's no matter. Brandon Weeden and his 5.1 passer rating is surely up to the quality of the rest of the quarterbacks the Eagles will face. And the Browns' other offensive weapons were at least average, right? Save your outrage. Embrace "rusty." And wake me up next week in time for the season opener against the Ravens. There's a game I'm looking forward to. Tagged with Marty Mornhinweg, Pass Blocking, Preseason, NFL, Run Blocking, Offensive Line, LeSean McCoy, Michael Vick, Brandon Weeden, Danny Watkins, Jeremy Maclin, Philadelphia Eagles, Defense, Week One, Andy Reid, Cleveland Browns, King Dunlap, Interceptions. September 10, 2012 by Brian Solomon.